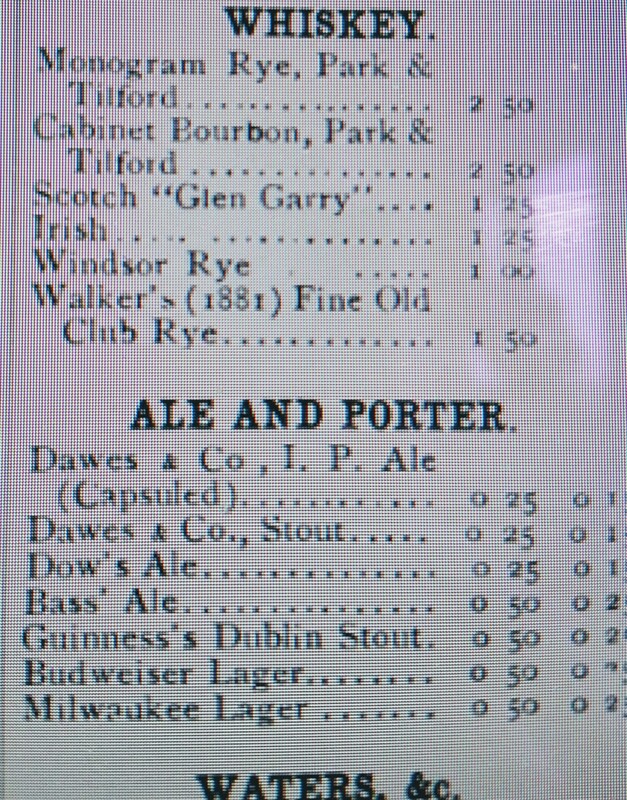 The second alcohol ad of interest in the October 15, 1941 issue of the Montreal Gazette was for Dawes Black Horse Ale. I discussed the Dawes Brewery in an earlier post. In that article, I assumed Black Horse Ale evolved from an India Pale Ale which is surely correct, as below we see an 1890 listing for “Dawes I.P. Ale”, clearly an India Pale Ale. It’s from a menu of the Windsor Hotel in Montreal. There was no India Pale Ale in Dawes’ product line as such by 1941. A chilled, well-carbonated “sparkling ale” type had replaced it, the Black Horse Ale. In my scholarly article on American Musty Ale, I cite a statement from a director of the Molson Brewery 20 years earlier that the new type of ale supplanted the strong, cellared ales of English tradition. By the time I started to drink beer in the 1970s, Black Horse Ale was long off the market although you would still see old signs for it in groceries. Black Horse Ale was probably pretty good. It would have been top-fermented in open vats, well-hopped, and given a reasonable period of cold-aging, or maybe a combination of cold and warm aging. No beer available today in my view gets at this older Canadian palate, the closest are Labatt 50 and Alexander Keith’s India Pale Ale. On the craft side, Sleeman Cream Ale may recall mid-1900s Canadian sparkling ale, or one form of it. Some of the craft breweries claim to make a mid-1900s Canadian ale but it is hard to know how close these are. Some remind me of bottled and canned English pale ale from the 1970s and 80s. But maybe the earlier Canadian ales were like that. In my own memory by the 1970s certainly, the eastern Canadian ale brands were fairly anodyne. They were somewhat different to the lagers of the same companies, but not that different. Black Horse was well-marketed in its heyday including among the francophone majority. Quebec used to be proud of its adherence to the ale tradition, inherited not just from the English who dominated business after the Conquest, but the earlier, French-derived brewing tradition. All this background was top-fermented brewing, so the ales, even in modified hybrid form, remained favourites into the 1970s. O’Keefe Ale, Molson Export Ale, Laurentide Ale, and Labatt 50 Ale were the main brands. Molson was the home favourite, made on the St. Lawrence River in an old part of the city since the late 1700s. Labatt was an incomer from Ontario but making gains. O’Keefe Ale also came from Ontario, it vaunted its seedless hops method around this time. The ad copy said the ale was less bitter as a result – the writing was on the wall for Canadian ale even in its modified, sparkling ale form. What remained of the old ale culture was swept aside largely by lager proper. First came Labatt Blue, then Budweiser and Miller. Molson Canadian Lager never was marketed actively in Quebec, the name and image were too “national Canadian”. Budweiser was brewed in Canada but quite close to the U.S. one (and had the apple-biscuit flavour it has since lost IMO). So tastes started to change and with the dry and ice beer phenomenon of the 80s and 90s, the beer palate became altered in a fundamental way. Despite the rise of the small breweries, most beer sold in Quebec and eastern Canada remains the generic, adjunct lager type. Still, in beer-aware circles, India Pale Ale is le dernier cri. And it has brought back not the Dawes taste of 1941, but 1890, more or less. But in 1941, zesty Dawes Black Horse Ale was a local favourite. The Gazette ad shows an older man drinking it, probably in deference to the fact that an important demographic for beer was in uniform. Still, it is interesting to see an older person in an ad like this. Older people are almost completely ignored in modern beer advertising, which is a serious omission as people are living longer. The superannuated like beer no less than the bright young things. They may not pound it, but they can make money for breweries who see the opportunity. Note re images: The first image above was extracted from the original news story linked in the text and the second from www.chadbourneantique.com, here. All intellectual property in the sources belongs solely to their lawful owner or authorized user, as applicable. Images are used for educational and historical purposes. All feedback welcomed. Black Horse Ale disappeared from Ontario Beer Stores in 1985 when Carling-O’keefe, who brewed it, launched the Canadian brewed version of Miller High Life. Other casualties from that launch: Dow Ale ( in Ontario), Kingsbeer, O’keefe Blended Old Stock Ale, Carling Red Cap, Cinci and Dow Cream Porter. Interesting: not a fair exchange, imo! Thanks for writing, I remember your name from craft brewing in Ottawa if I’m not mistaken. I moved to Ontario in 1983. I don’t recall all the brands you mentioned at Brewer’s Retail then including Black Horse, but it’s a long time ago. Do you remember Brading Ale by any chance? If so, any taste recollections? I recall buying Black Horse Ale — although occasionally — well into the mid-80s. From Brewers Retail locations in southern Ontario. I have a friend who bought 24-packs fairly regularly. I will ask him when it disappeared. Thanks for this, very interesting! 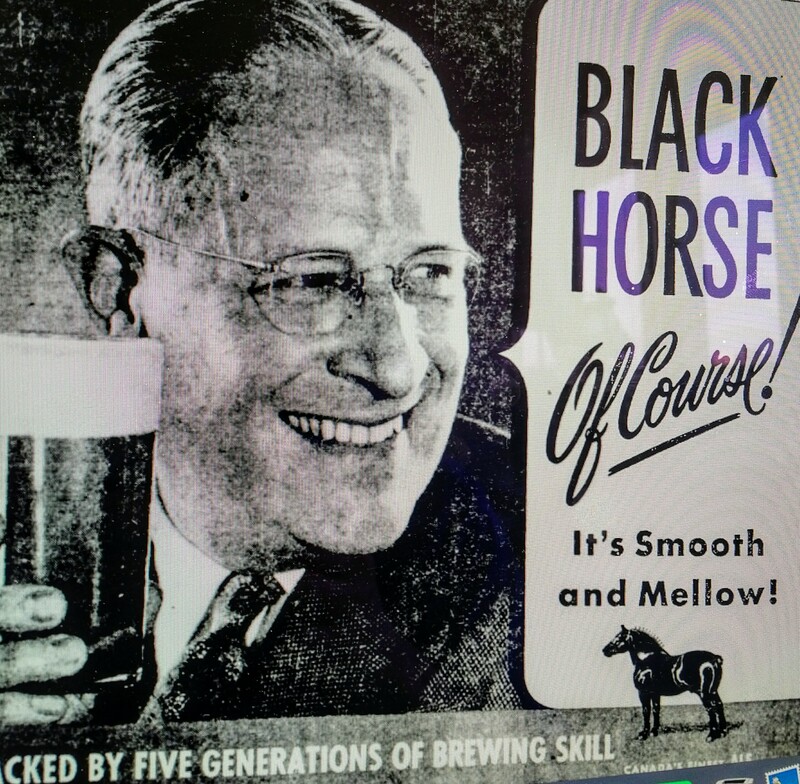 In the 70’s and early 80’s, at least two US brewers sold a Black Horse Ale. Koch in Dunkirk New York and another in New Jersey. I was a real fan of the Koch version as a resident of Buffalo at the time. I also remember seeing a Black Horse Ale in the Ontario beer stores and wondering if it was another manifestation of the same branding in the same way that Carling Black Label had both Canadian and US versions. Thanks, I referred to those briefly in my earlier article on Dawes dealing with the museum exhibition in Lachine, QC (or rather in the comments under that article). I also remember the one made by Fred Koch, which I used to buy on trips to Buffalo in the early 80s. I never had the NJ one. I’ve never looked into any linkage with the Canadian Black Horse. Jim Robertson’s The Connoisseur’s Guide To Beer, which came out IIRC in 1978 and 1982 (different editions) mentions all of them and may address the parentage question. I’ll pull out his book and try to find other information. Fred Koch sadly expired by the time I got to Dunkirk but the beers were in the stores for a while including Jubilee Porter, made in the period when Fred Koch was owned by Vaux in England. Gary yes thanks and I know we’ve discussed before. The Black Horse there now and for some years is a lager, not the original formulation, but perhaps still has some of its DNA. Ask Morris to bring some the next time he visits.